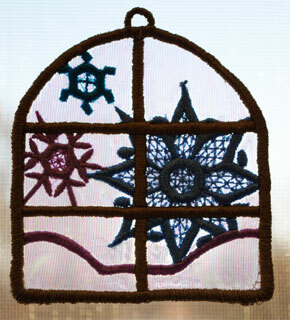 Applique designs are so versatile. They can be used as a traditional applique on apparel or a quilt and they can also be used as a stand-alone piece, much like freestanding lace. The Window with Snowflakes ornament (XM1791) from the Merry Christmas Ornaments set by Dakota Collectibles features 20 freestanding lace designs in applique format. 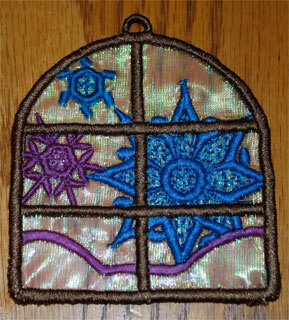 By using a sheer metallic fabric where the applique fabric goes, this window really looks like a window. You could probably do the same with a clear vinyl. Hoop a water-soluble stabilizer. 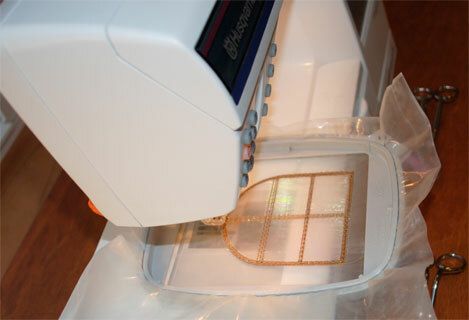 Spray the back of the sheer metallic fabric with a temporary adhesive. Finger-press it on top of the stabilizer. Use the same color of thread in the bobbin as that with which you are stitching. That will keep the back of the window looking as nice as the front. 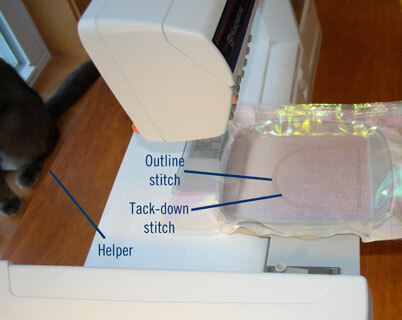 The first stitch-out is an outline stitch for placement and the second stitch-out is a tack-down stitch, typical to applique. 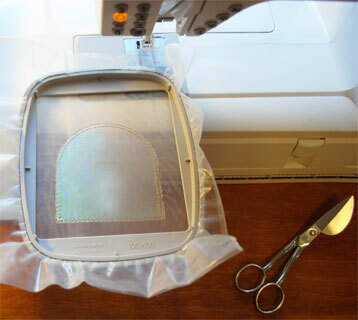 Especially when using a sheer fabric, I prefer to keep it as large as the inside hoop size and stitch both the placement stitch and tack-down before cutting the fabric away. That way, there are two rows of stitches to hold the sheer fabric (helper is optional, but recommended!). After the tack-down stitch, remove the hoop from the machine but keep everything in the hoop. Carefully trim around the outer stitch with applique scissors. They allow you to get very close to the stitches without clipping them. 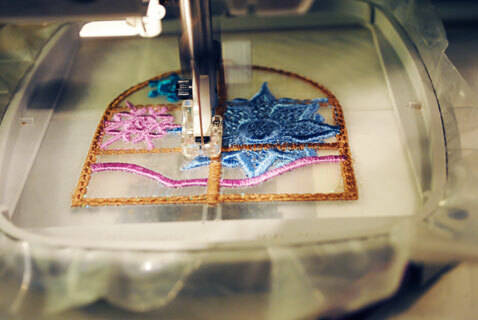 Attach the hoop to the machine and continue stitching. When stitching is complete, remove from the hoop, trim the excess stabilizer, and rinse in warm water to remove the rest of the stabilizer. I like to minimally rinse in a freestanding piece such as this. You don't want any showing in the center of the design, but if some water-soluble stabilizer is left in the stitches, the piece will have some stability. Roll flat with a brayer (that's Pat's tip!) and let it air dry. Then, attach a hanger and place it in a window or on the tree.